You may get your email from multiple sources to cater for failures or just handy to have access while on the road. For example retrieve email from your ISP from both a home mail server and your Gmail. In this case your want to instruct both your home mail server and Gmail to not delete email from the ISP’s pop mail server, the problem is neither Gmail or my home server will provide a setting of delete the pop mail after so many days and my pop mailboxes fill up over time. Using a simple one line script and adding it to a cronjob does the job of deleting this old mail still sitting up on the ISP. CAUTION: The script will delete mail, test it first with a different command or on a test mailbox that does not matter to you. The above script will delete all mail in the users mailbox that is 30 days or older. Until IPv6 is really required you may want to totally disable it from your network, to do this in Windows 7 and Ws2008 you need to do more than just un-tick the check box in the properties of the protocol section. Click Start and type regedit in the Start Search box, and then click regedit.exe in the Programs list. Type 0 to enable all IPv6 components.Note The value “0” is the default setting. Type 0xffffffff to disable all IPv6 components, except the IPv6 loopback interface. 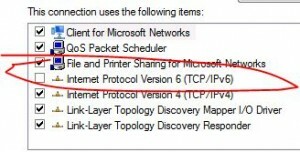 This value also configures Windows Vista to use Internet Protocol version 4 (IPv4) instead of IPv6 in prefix policies. Type 0x20 to use IPv4 instead of IPv6 in prefix policies. Type 0x10 to disable native IPv6 interfaces. Type 0x01 to disable all tunnel IPv6 interfaces. tcpspy is a Linux utility that can monitor inbound and outbound network connections and is probably best suited for small or home networks. While the tool is fairly old it works great and can be very effective. The alternative is to use a network monitoring system together with an IDS system such as Ossim and Ossec, but this can be an overkill for a small network, so tcpspy will fit nicely under those requirements. How to test your IDS is working? Comments Off on How to test your IDS is working? Here are a few ways to test your IDS/IPS system is working. Here is a good article on replicating webservers content running linux. Here is a great video on what cross site scripting is and a demo.